Edinburgh Monarchs manager Alex Harkess has told his team they must “step up” in the wake of their shock 46-44 loss to Workington Comets at Armadale seven days ago. If they don’t start showing signs of improvement then Harkess fears Monarchs will end up as also-rans in the Championship. Disappointment was etched all over his face as he entered the pits after last week’s match and he has told his riders in no uncertain terms that he expects them to show more grit and determination beginning with tonight’s league clash against Newcastle Diamonds which begins a run of league and cup matches that may well define the club’s season. Reflecting on the Workington fixture, Harkess said: “I was disappointed as anybody would have expected me to be. Workington scored more points than us. Our riders are simply not scoring as they should. There is frustration to a degree that Australian Josh Pickering has simply not pushed on from 2017. Said Harkess: “I don’t know what’s gone wrong with Josh, and the rest of them are just not progressing as we had hoped. Harkess has concerns over Monarchs’ home performances and feels they are a soft touch around their own circuit. “We couldn’t qualify for the Championship Shield anyway against Workington but it was our display that I was worried about. We have got to get back into the habit of winning at Armadale – and we must kill off teams. 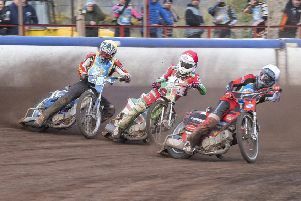 Instead, we are allowing teams to be in with a chance of winning with three heats to go as was the case against Workington. “It was disappointing in the regard that Workington’s riders are big-track specialists who nevertheless rode well enough to beat us at home. “Full credit to Workington who deserved their win, but we were well below par. American Max Ruml drops down to reserve swapping places with Pickering starting this evening. “Max has become a concern and we are concerned about him,” added Harkess. “Max is at reserve now and that is a position you expect people to make their own to try and get back into the team proper. If Ruml doesn’t start firing at No.7, one wonders about his future. Monarchs have made a big investment in bringing him over and won’t want to release him early. Some Monarchs riders were unhappy about the state of the track – particularly at the starting gate – last week following a decision to soak it 24 hours earlier to keep down the dust. Monarchs conclude their Championship Shield qualifying campaign at Berwick Bandits tomorrow and then travel to Newcastle on Sunday in the return league fixture.